To the dismay of the region’s winemakers, the unwanted visitors prefer sweet pinot noir grapes, which sell for far more than merlot and cabernet sauvignon. The animals also like a nice chardonnay and have been known to get a bit tipsy after snacking on grapes that have been fermenting out in the sun. The baboons are a major headache for winegrowers, who have tried to deter them with electric fences, but all to no avail. Baboons can dig underneath it or swing above it from trees to get to the vineyards. They also test the fence for weak spots. If they’re shocked, they’ll scream, but they’ll likely return the next day. Some farmers also plant grapes outside their fence line, a sacrificial offering that reduces the number of primate trespassers. Francois van Vuuren, farm manager at La Terra de Luc vineyards, 50 miles east of Cape Town, lamented the baboons’ choice of grape. Baboons have raided South Africa’s vineyards in the past, but farmers say this year is worse than previous ones because the primates have lost their usual foraging areas due to wildfires and ongoing expansion of grape-growing areas. 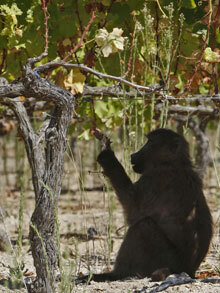 Sometimes the baboons even get an alcohol kick – by feasting on discarded grape skins that have fermented in the sun. After gobbling up the skins, the animals stumble around before sleeping it off in a shady spot.